Welcome to the second “A Look Back: Datamining the Future” series about datamining and general data files! The previous “Datamining the Future” article was posted back in November 2014. It’s been almost 4 months now and it’s time to take another look at the data files and ask the questions: What was guessed correctly? What were we horribly off the mark on? And what do the existing files yet to appear on Live tell us about what’s coming next in RIFT? This will be quite the read, so pull up a chair (if you’re using a standing desk) and get comfortable! When the ‘mount_bike’ files started to emerge, I took a look at a mechanical mount-like skin I was unfamiliar with and guessed it was the Arclight Rider mount skin. Turns out it’s just the Knight Spider mount from Carnival of the Ascended. Whoops! Initially the above mech skin was assumed to be a potential candidate for the ‘mount_disc’ since it had a disc-like mid-section and a lot of components look rather flat, like a disc. The device in the top-left corner of the skin could have been one of the engines attached to the sides of the mount to keep it afloat. But no, we’ve now seen two of the Disc (Lifter) mounts in-game and they look nothing like this. At that point the obvious answer would be that it’s a Cataphract Lancer from Tyrant’s Throne – but the Storm Legion mechs look different from this. Could this be…the Levitate mount? April 2015 is when Trion expects RIFT 3.2: Echoes of Madness to come out. Besides Instant Adventure improvements, Hammerknell IAs, a Tier 2 “Intrepid: Hammerknell” raid and a major revamp to the Wardrobe system mentioned during PAX East – what else can we expect for 3.2 and beyond? Interesting Icons – Alchemy, Bundle, Mount and Fairy Costume icons. Monty & Rodney combat pets. More Mounts – Threshers, Kitsunes, Lifter and Levitate variants! Other Files: Grass Skirt Costume, New Artifact Types and Finric Warfront Announcer. There’s 25 new ability icons, bringing total ability icons from 1,963 to 1,988. Mainly Reaver soul revamp changes, and reactives for Nightmare Tide. There’s been 338 new item icons, bringing total item icons from 9,235 to 9,573. Alchemy, Bundle, Mount and Fairy Costume icons. Here’s a few ‘alchemy_item’ icons found in the old March 2014 files. These could simply be age-old icons left behind from a pre-Beta RIFT that might have originally combined Artificer and Apothecary professions. These icons exist in some form already on Live. However, these could also relate to the elusive ‘Temporal Alchemist‘. These two words were uttered during the 14th March 2014 livestream. At that time Daglar was chastised for describing Physicians as ‘alchemical archers’ because it could cause a mix-up between Physicians and the ‘Temporal Alchemist’ – something that they were “not ready to talk about yet”. The ‘Temporal Alchemist’ has not been mentioned since. Was its name changed to Dream Weaver? Was it scrapped? Now that we know there’s a 5th Calling slated for this year (code name “Primalist”), could the ‘Temporal Alchemist’ be one of its souls? It’s possible: I can already start to imagine a soul that relies on throwing potions, adding unique coatings to other players’ weapons and armor, and summoning nasty creatures from their cauldron – a support soul perhaps. One piece of speculation is that the ‘Primalist’ Calling could be related to each plane. If that is the case, the Temporal Alchemist could be a soul related to the Plane of Earth. In another livestream, Lead Content Designer MikeD mentioned that the Planes didn’t have to be tied down to normal expectations, citing the example of the Plane of Earth, which could be associated with time. ‘Temporal’ = relating to time. Link? Maybe. A couple of Bundle icons were found in the icons folder. The bundle_dimension_plants and bundle_of_supply_crates are currently used by Dimensions as “Mystery Box: Dimensional Wonders” and “Bundle of Mystery Box: Dimensional Wonders” under RIFT Store -> Dimensions. However, the rest of the dimension bundles are either planned in the future or something that has already been retired. The bundle_clothes icons might have been used in the past, or perhaps for Summerfest swimwear bundles. They could also potentially appear as part of a promo for the launch of the upcoming 3.2 Wardrobe System. The bundle of tokens/potions are interesting – never seen those before. Either Trion will put them up in the future as bundle deals or perhaps these items were abandoned in favor of limited time discounts that occur for various sections of the RIFT Store from time to time. The bundle of artifacts is probably not a purchasable item but instead something like a future achievement or quest reward. It could also be the icon used for those Unstable Artifact Thief Caches which contain a ton of Unstable Artifacts that are given away every now and then on Trion’s Livestreams. mount_raproroq_v1 – This might be a scrapped, early version of the Ash Strider mount that you see in the next 4 icons. Would love to see the colors in-game though. raptor_ice and raptor_fire – These are the Infernal Strider and Ice Strider mount icons. mount_raptor_epic, epic2_a & epic_a – The first icon is the Swift Armored Ash Strider mount that you get on Ember Isle with The Keepers notoriety. How about the second, red icon? Will we ever get to see a red version of the Swift Armored Ash Strider mount? I sure hope so! The third purple-glowing raptor_epic icon would be the Ravensong mount. mount_2 – What is this? A chameleon mount? The number 2 sounds like this is a fairly early mount. Perhaps it was scrapped. mount_5s – These mounts are Tartagons. Currently there are only 3 Tartagon Mounts: Ancient, Mossy and Shiny. All three use the red icon. The Tetromino companion pet gained as a Tarken Glacier puzzle reward uses the white icon. So where’s the green icon from? Is it a new color for the Tartagon mount? Another scrapped skin? Two words: “Fairy Wings“. 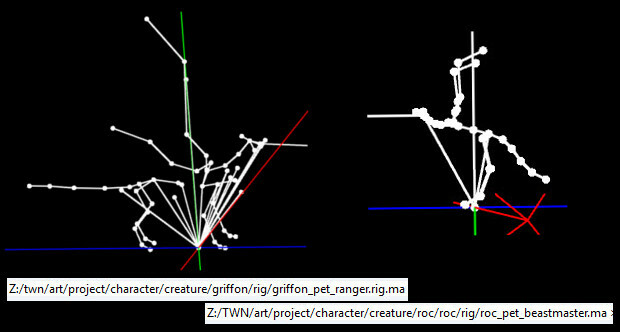 PTS Datamining from back in July 2014 revealed a skeleton rig for a “human_male_wing_fairy.ma” and there were plenty of action script files relating to fairy wings for each race. The large amount of race-specific animation files clearly shows that this isn’t just a skeleton rig for – say – Hylas or Swarmlord Khargoth. It’s also clearly not just the Cleric’s Druid combat pet skins or the Cake of the Fae disguise because there would be no reason for there to be separate animation files for each race and gender. This is clearly for the players. It’s been more than half a year since these were posted up on the PTS – are these Fairy Wings still on the plate? Perhaps they were supposed to be released with Summerfest 2014 but didn’t make it so have been pushed back to Summerfest 2015? If they haven’t been scrapped, Summerfest 2015 seems the most likely time that these pop up on Live, given the theme. The naming of the file “fairy_wings_01” is also interesting and suggests that we could possibly end up with a new armor/wardrobe piece slot – Wings, or perhaps just another option for the Cape slot. The skeleton rig looks completely different from what capes usually look like (they’re usually just a ton of lines extending downwards from a single point), so it does seem like a separate, new feature. The timing would be just right for Trion to reveal a new wardrobe piece slot to align with the Wardrobe changes that are slated for Patch 3.2. Wings could potentially be added to the collections system via the Cape slot. It isn’t too farfetched to think that when you click on the Cape slot, you get to select from both Capes and Wings. Yep, it’s Monty and Rodney again. These combat pets for Warrior Beastmasters and Rogue Rangers respectively have been shown off since as far back as July 2014. In fact, the previous “A Look Back: Datamining the Future” article also mentioned these two pets. We have screenshots of the Greater versions of the combat pets, skeleton rigs and even icons. So what are we waiting for? Well, Vladd has responded to players about these pets in past Trion Livestreams stating he is still working on them. ETA is still unknown. Previously I predicted it would come out with 3.1 but that clearly hasn’t occured. Given how close 3.2 is to release (~April) and with the announcement of the 5th Calling “Primalist“, it’s hard to tell just how far these two pets will be pushed back. 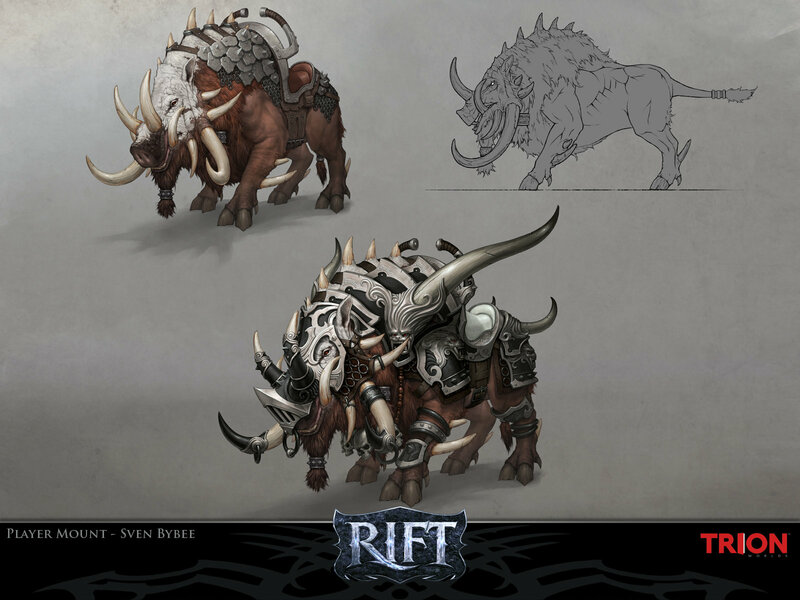 Concept Art Mounts – Battle Boar and Great Hounds. Nein! It uses a similar skin, but you’ll notice that the Imaw companion pet doesn’t have a saddle or any leather straps, whereas the Nightmare Thresher Mount Skin does as seen in the bottom-right (saddle) and the leather straps in the middle and top-left of the image. There’s no doubt that the Purple and Nightmare Thresher skins are for mounts. When we’ll see these is anyone’s guess, although I have an odd inkling that the Nightmare Thresher Mount might end up becoming the Conqueror reward for the Tier 3 Lord Arak Raid since it matches the whole ‘nightmare’ theme that surrounds Lord Arak. There’s only been one Kitsune Mount that has appeared on Live thus far, and that would be the Red Kitsune mount. Grey, Cross, Burgundy and Arctic Kitsune Mounts. When will they be showing up? No one knows, but as always – keep an eye out! The first looks to be Death-themed and the second Life-themed (flowers). Not sure what the gold/green is themed after – perhaps Earth or Tribulation (nightmare). Haven’t found models for these yet which might shed light on their theme (via file names), but I’ll keep a look out in future patches. Back in January, datamining showed Levitate, Disc (Lifter) and Bike (Rider) mount information in various configuration files. The Levitate mount is actually up on the PTS now since March 20th! Unfortunately no preview, but this confirms the mount actually exists. For some time I was almost convinced the ‘mount_levitate’ was just an internal name for the Free Camera Mode used in dimensions. What the mount looks like is anyone’s guess. I think it’s not an actual mount but your character hovering in the air, but perhaps a skin will pop up on the PTS in the next few updates that will prove me wrong. Battle Boar Mounts (Armored and Unarmored). 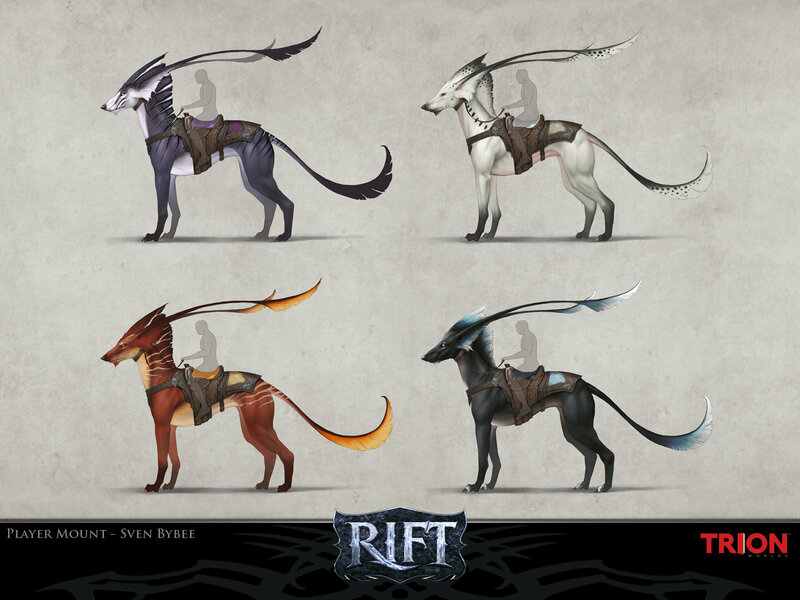 These were added briefly to RIFT Lead Concept Artist Sven Bybee’s ArtStation profile – although they have since been removed. Both Unarmored and Armored Battle Boar mounts! This mount was mentioned once in passing in a previous livestream. It looks like it could use the Ursin (bear) mount animations. Four Great Hound Mounts. These look like they would fit perfectly with either the Ki Rin animations, or elongated Vaiyuu animations. You can find more Concept Art of items that have yet to hit Live or the PTS here. The Draumheim Ship model still remains a mystery. I originally thought it would be part of the ‘Leviathan’ zone event when only the achievement was known, but that proved fruitless. This ‘Draumheim Ship’ is clearly not one of the Bloodfire ships you see all over the place. The ‘Draumheim Ship’ could be used the same way Queen Miela’s “The Endeavor” ship is used when introducing Storm Legion, perhaps giving us prelude quests that lead up to Myrkur’s Depths. We have to get there somehow and using a ship to travel through the oceans of the Plane of Water sounds just about right. Increasingly it sounds like the ‘Myrkur’s Depths’ zone will contain the Lord Arak Raid and a heavy Nightmare/Tribulation theme. I wouldn’t be surprised if we learn that Lord Arak has escaped to Myrkur’s Depths after the failure of Mount Sharax and Kondraum takes us to the zone via his ‘royal ship’. Models for the Lord Arak Raid have been datamined in the past and this raid has since been pushed back to Tier 3. The raid is completely new with what seems to be some new mobs, new models and locations. The next tier of raiding has been in development for a bit. We do want to move back towards Hammerknell-style raiding. …More content being available at release when the zone comes out; maybe more choice on which ways you go inside the raid. There’s also a few skins or concept art that probably relate to the Lord Arak Raid. The theme is obviously nightmares, and the skins show a cracked, stoney texture to statues and even weaponry, highlighted with the green glow that represents Nightmares. Notably, there’s a clear absence of the eyes that are so prominent in Nightmare Rifts and the Tribulation soldiers in Draumheim. The ‘hair’ on the statue skin, the robes and the coliseum-looking building for the first End of Reason model seems to suggest an Ancient Greek/Athens/Rome-style theme to this instance. As for the Ape with the glowing chest…perhaps a gladiator? There’s a few things already available in the data files on the PTS for the Tier 3 Lord Arak Raid and as Archonix stated before, it’s been in development for a while. Look forward to a brand new instance probably some months after Tier 2 is released. This grass skirt costume was datamined just before Tyrant’s Throne came out and I initially assumed it would be for an NPC or wardrobe set being added in with 3.1. Instead it’s remained elusive. Perhaps it’s for a wardrobe bundle for Summerfest 2015. Not from the data files, but Senior Design Director (‘the artifact guy’) Dead Simon posted back in the 20th January 2015 on the RIFT forums the image above. He was talking about changes that were coming to Artifact Tracking Vials, but the image he showed seemed to tease three more types of Artifacts: Green, Purple and Orange. Speculation is that the green has something to do with Nightmares. In fact, the Darkness From The Depths zone event in Tarken Glacier sounded like the perfect candidate for the introduction of Nightmare Artifacts because you can speak to an NPC during this particular zone event to go into either a Nightmare or Dream state. It was assumed that in the Nightmare state you would be able to see not only Nightmare invasions (as you do now), but also Nightmare Artifacts. Still, three new artifact types is definitely something to look forward to, especially if they come with all new titles, pets, mounts and dimension items. Interestingly, Dead Simon hasn’t been heard from since that 20th Jan post. He must have been locked away by Trion in a room, adding Twisted and Unstable artifacts to the Plane of Water and creating all those artifact sets for the new artifact types. We currently have the default warfront announcer for each faction as well as announcer packs for Alsbeth, Borrin, Cyril, Dacia, Faceless Man and Orphiel under RIFT Store -> Services. Well, past datamining shows Finric (or generic Skelf) Warfront Announcer-style sound files. Chances are we’re going to be getting a “Warfrount Announcer: Finric” option in the future. You can download/listen to a compilation of the sound files here. The normal warfront announcer sound files seems to begin at 1min into the music file. However, the earlier sound files could also be warfront announcer sound files – some sound like stuff Finric would say if you win/lose a warfront, or for objectives. Note: Due to the way these sounds are extracted, they will be slightly off from what they actually sound in-game. If you are having trouble getting the file to play in your browser, either try a different browser or download the file via the down-arrow button at the top of the page. Quite a lot of datamined files that have yet to appear on Live or even the PTS. There’s quite a few mounts that Trion have been saving up for a rainy day, new artifact types and the future Tier 3 Lord Arak Raid to look forward to. And what about those Fairy Wings? That and information on the ‘Temporal Alchemist’ would be most welcome! Don’t forget to check out the PTS/Live Comparison Page for other future additions to the game mentioned by the devs from various sources and look forward to another “A Look Back: Datamining the Future” article in a few months’ time!